POTOMAC, Maryland -- The deepest race of the Bullis Invitational on Saturday turned in the kind of performances that re-wrote the national leaderboard. And it bucked trend. Harford Technical (MD) sophomore Caitlyn Bobb, who trailed from the start, rallied in the final 100 meters to win in a US No. 3 time of 53.72 seconds, just ahead of Georgetown Day School's (DC) Ziyah Holman, who followed in a US No. 4 time of 53.84 seconds. The pair are now just two of five girls nationally now who have broken 54 seconds in the quarter. Before the duo even lined up, it was destined to be a quality race. Holman, who finished her indoor season US No. 3 in the 500m, had earned All-American honors last June at New Balance Nationals Outdoor with a 53.59 performance--good for fifth-place as a sophomore. 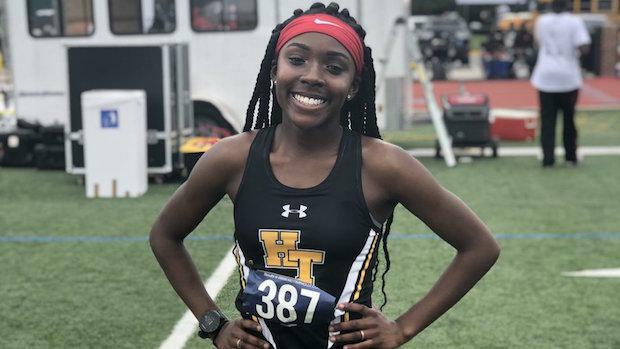 She entered as the favorite with a handful of girls capable of breaking 55 seconds in the mix and entered having run 54.96 last week at the Trojan Invitational in Gaithersburg. Meanwhile, Bobb was one of Holman's top challengers. She was the reigning Maryland Class 2A state champion in the event, having run 55.79 last spring as a freshman. But she was coming off short rest, having raced at the John Hopkins Invitational on Thursday. And Holman knew it, seizing the race quickly with a hard charging 200 meters. But Bobb, who has co-citizenship with Bermuda and will compete in the CARIFTA Games in April, bided her time before making her move on the final stretch. Holman's form began to break down at the end, and Bobb pounced, scoring a new personal best. Holman followed.